I really appreciate your feedback and I am very happy to read that your experience with us was memorable. 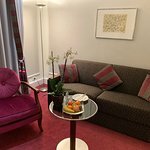 Thank you so much for choosing the Hotel Schweizerhof Zürich as your residence and for taking the time to publish your review. It will be a pleasure to share your kind words with our team. Welcoming you back soon would be a great delight and should you have any special desire or questions, do contact me any time. 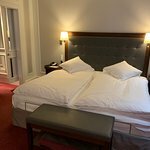 Thank you very much for taking the time to share your experiences at the Hotel Schweizerhof Zurich with us. We are very pleased to hear that you enjoyed your stay to the fullest and that we were able to delight you with our unique location and our professional service. Our team does its best to make every guest happier and your feedback is the best way to thank us. I wish you all the best and I am looking forward to welcoming you soon again here in Zurich. Thank you so much for being our guest and for sharing your great experience with us. It is a delight seeing that the services provided by our Concierge met your fullest expectations, as well as our location. I will gladly inform our Concierge team about your compliments, thanks you so much. Welcoming you back would be a great delight and should you have any special wishes or questions, gladly we will assist you. We are very honoured to receive your feedback. It is great to see that our location and most specially, the butler service exceeded your expectations. Thank you so much for taking the time to share your wonderful review with us and for your trust. I will gladly inform our team about your wonderful compliments. You are always welcome to stay with us and should you have any special desires or questions, please do contact me any time. Thank you so much for being our guest during your visit to Zurich and for taking the time to share your experience with us. I am very happy to read that we were able to provide you with an early check in. Thank you very much for letting us know in advance. We are also glad to know that the goodies provided met your expectations. Welcoming you back would provide us with joy and should you have any special wishes, please do contact me directly. Thank you so much for taking the time to provide us with your great detailed feedback and for choosing our hotel in Zurich as your residence. Seeing that your experience with us surpassed your expectations and you and your significant other had a romantic weekend, fills us with great joy. It will be a delight to share your compliments with our team. Thank you. We are always happy to welcome you back and should you have any special wishes or questions, please do contact me directly.